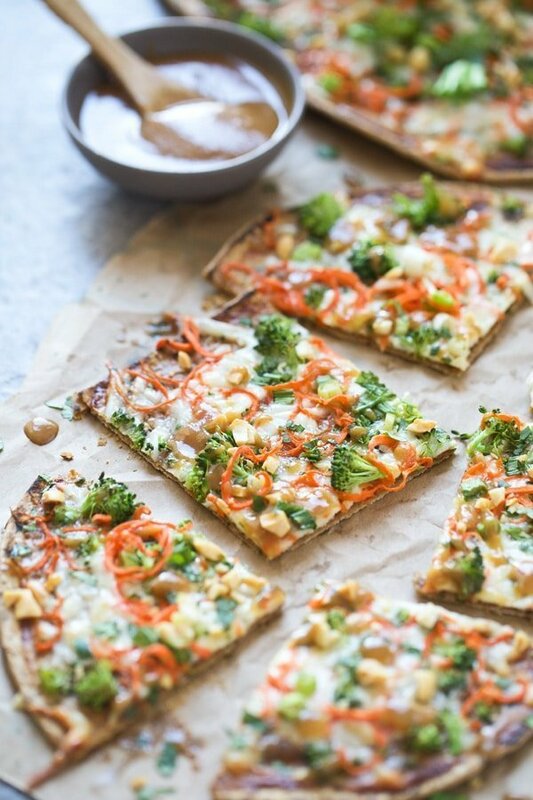 These Thai Veggie Flatbreads are made with thin whole-wheat flatbreads smothered with an easy peanut sauce, low-fat mozzarella, and tons of veggies. They’re the perfect light, healthy and DELICIOUS meal. My new favorite lunch, dinner and snack all in one. Well, because they’re perfect for an easy, but filling lunch on their own. Totally satisfying paired with a bright salad for dinner. And when each flatbread is sliced into squares and served on a giant platter, they make the perfect party snack to share with friends. Pizza is one of my favorite ways to have an excuse to slather something in homemade peanut sauce, because alongside homemade hollandaise and alfredo, peanut sauce is something I shamefully, could drink through a straw. So having a vessel to legitimize the sheer quantity of tangy peanut sauce I could consume is a must. I’ve had countless Thai pizzas in my lifetime, and I even shared this French bread version a few years back, and while I adore it and make it to this day, I wanted to make something that made me feel a little less guilty after eating it. After discovering these flatbreads at a friend’s house a few months back, I’ve been using them to make my toddler healthy versions of pizza, cream cheese rollups and peanut butter sandwiches. They’re packed with protein and fiber, super filling and they just taste GOOD. So! When I was brainstorming ways to lighten up my favorite Thai pizza, these were the first thing that came to mind. 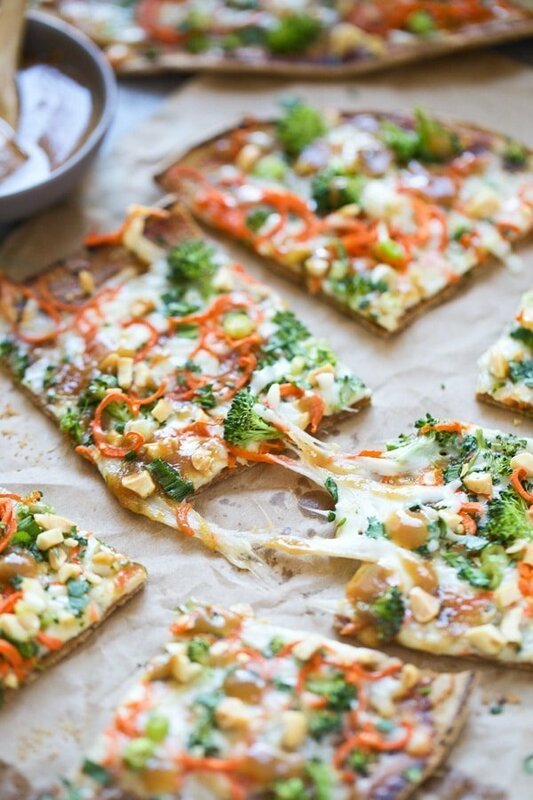 Each flatbread is smothered with homemade peanut sauce, sprinkled with low-fat mozzarella cheese and then piled high with chopped broccoli, carrots and green onion. They’re popped into the oven until brown and bubbly and then sprinkled with plenty of chopped cilantro and peanuts. Right before serving they’re drizzled with more peanut sauce and ready to be served. While I kept these guys vegetarian, you could easily add in some diced chicken or roasted shrimp alongside the broccoli and carrots. The vegetable list is also interchangeable. If red bell peppers are on sale, they’d be a great addition, or if red cabbage is your thing, that would also work. Even chopped baby corn, water chestnuts or sliced snow peas would be delicious, honestly the choices are only limited to what’s at your disposal. Now, you can make peanut sauce a million different ways, and trust me, they will all be delicious, but my favorite versions have plenty of creamy non-organic peanut butter, honey, soy sauce and a secret ingredient…water. For years, I couldn’t figure out how to get the perfect texture to my peanut sauces, and it turns out, all I needed was a neutral liquid to balance out all the flavors and thin the sauce out a little bit. Who would’ve guessed?? For extra flavor, I also used a little bit of sesame oil and rice vinegar, and if you like spice, I’d also drop in a few pinches of crushed red pepper flakes. All you have to do is whisk all the ingredients together, taste for seasoning and it’s ready to be slathered on just about anything. 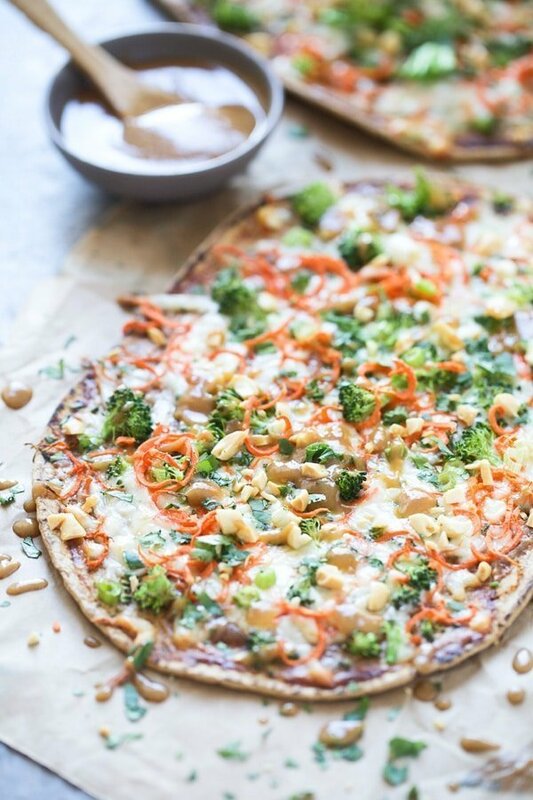 Super thin whole-wheat flatbreads smothered with an easy peanut sauce, low-fat mozzarella, and tons of veggies. The perfect light, healthy and DELICIOUS meal! In a small bowl, whisk together soy sauce, honey, peanut butter, rice vinegar, sesame oil and water. 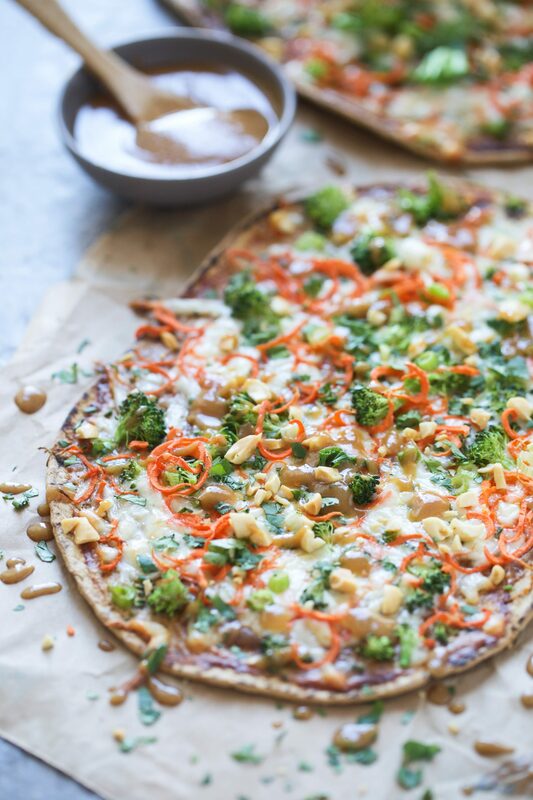 Spread enough of the peanut sauce on each flatbread to cover the surface. You want there to be enough left to drizzle some on the cooked flatbreads. 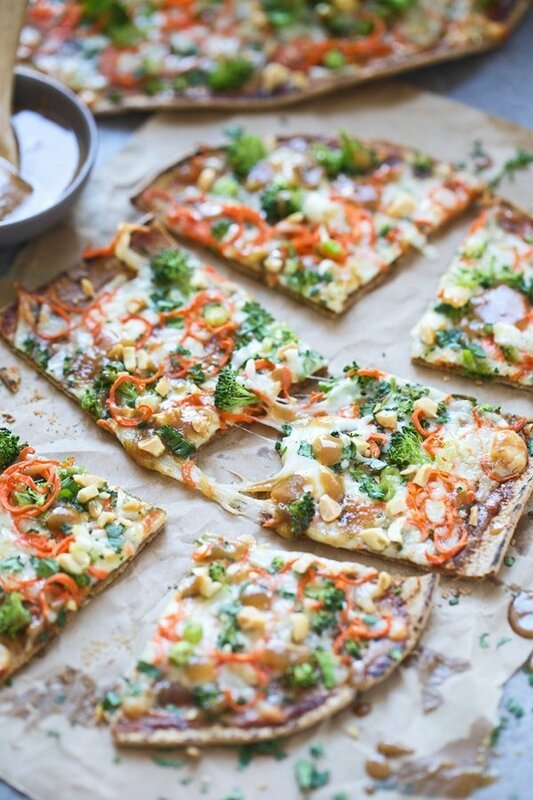 Evenly divide the cheese between the two flatbreads, followed by the broccoli, carrots and green onions. Place flatbreads on a baking sheet and cook until cheese is bubbly and hot, about 12-15 minutes. Sprinkle with chopped cilantro and peanuts. Drizzle with more peanut sauce. One Response to "Thai Veggie Flatbreads"